Exploring Central Park by bike helps you see and do more throughout your day. You don't have to pick and choose between attractions: You can hit Belvedere Castle and the Central Park Carousel in the same afternoon. Is it possible to make this comfortable NYC adventure even more convenient? It is if you find good Central Park bike rental deals! Let us show you how to spot the best Central Park rental discount and save on your NYC excursion. 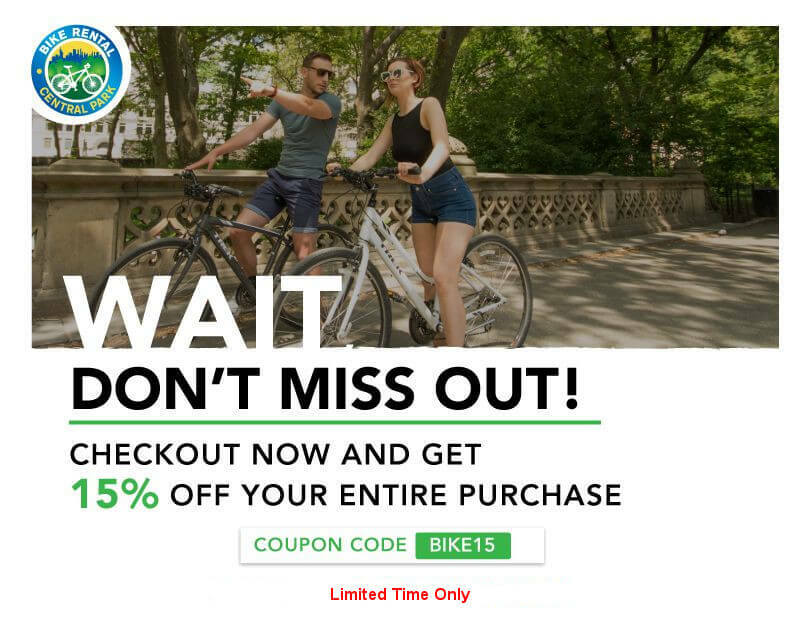 Although your first instinct may be to look for the best Central Park bike rental coupon first, remember that quality and value matter, especially when you're renting bike equipment. Searching "cheap bike rental NYC" can provide a mixed bag of results. Remember that the best price doesn't always mean the best deal. First, look at what's included. Your helmet and a bike lock should be part of the standard fee. When a rental company tries to charge you for these essential safety tools that you'll obviously need in order to enjoy your experience, you know that customer service and quality aren't their top concerns. Even if you get a good deal on the bike, the extra costs could cancel out your savings. Does the bike rental company offer accessories? If so, how much do they cost? Look for things like child seats and attachable baskets. These can make your trip easier and don't have to cost an arm and a leg. Check where the actual rental facility is located. The closer you start to the park, the better. Look for bike rentals within a block or two of Central Park itself. Remember, you pay for the time it takes to pedal from the shop to the park, so if you find a deal that looks great but the shop isn't conveniently located, you may be wasting your money. Watch out for deals that sound too good to be true. There's a difference between getting a Central Park bike tour discount and taking a tour that's just aimed at taking your money. A tour should be fun! There's so much to see and do in Central Park, and a good guide spends every minute immersing you in its sights, sounds, and history. Don't settle for the guy who will try to pressure you into buying his cousin's souvenirs or ice cream at the end of your adventure. Anyone can stand by a few bikes and offer to rent them out. These folks probably don't offer the same kind of insurance protection or quality equipment that established companies like ours do. Also, reputable companies let you make a reservation in advance. If you can't book online, you may not be dealing with professionals. The key to getting the best Central Park bike rental deals is simple. Go online and head straight to the source! The best rental companies, like Bike Rental Central Park, usually offer better values on their own sites than you'll find anywhere else. Whether you're looking for a bike today or planning a sightseeing trip for next week or next month, making an online reservation saves you big bucks. Online prices are always lower than walk-in rates, to the tune of up to 50%. You aren't going to beat that by chasing coupon codes on third-party websites! If you want a little structure in your adventure, your rental may pair well with a Central Park bike tour discount. Again, booking online directly with us gives you the best options. Your ideal Central Park bike rental discount is closer than you think: In fact, it's right here. See more, do more, and save more by planning your excursion online with Bike Rental Central Park!